Unit Text: 1st Airlanding Recce. Sqn. 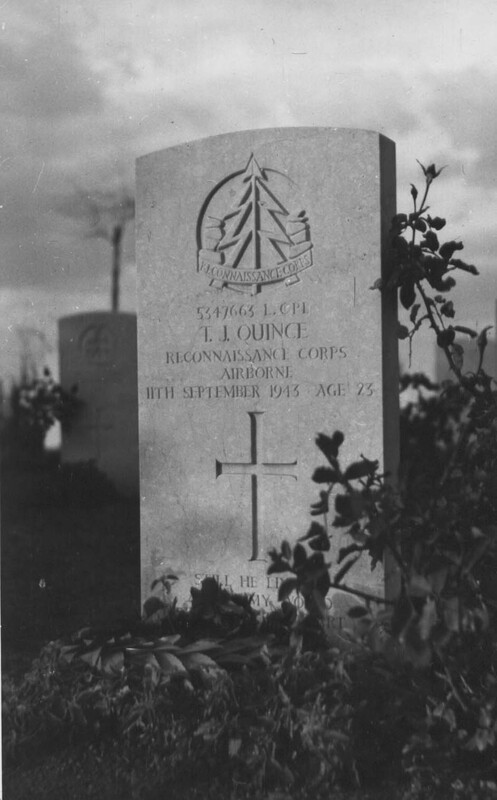 Additional information: Son of James and Edith Quince; husband of Patsy Quince, of Boscombe, Bournemouth, Hampshire. Grave/Memorial Reference: II. A. 30. Location Information: This cemetery is located on the outskirts of Bari in the locality of Carbonara. Take the tangenziale which is part of the SS16, skirting Bari, and which is accessed from the autostrada A14. From the tangenziale take the SS100 south to Taranto at exit 13B. About 3 kilometres from exit 13B turn right to Carbonara. Then a left turn will eventually arrive at the cemetery (about 1.5 kilometres from the SS100). Historical Information: On 3 September 1943 the Allied invasion of the Italian mainland began with landing in the south near Reggio and, a few days later, in the Gulf of Salerno. The invasion coincided with an armistice made with the Italians who then re-entered the war on the Allied side. Allied objectives were to draw German troops from the Russian front and more particularly from France, where an offensive was planned for the following year. The site of Bari War Cemetery was chosen in November 1943. There was no serious fighting in the vicinity of the town, which was the Army Group headquarters during the early stages of the Italian campaign, but it continued to be an important supply base and hospital centre, with the 98th General Hospital stationed there from October 1943 until the end of the war. At various times, six other general hospitals were stationed at Trani and Barletta, about 48 km away. Besides garrison and hospital burials, the cemetery contains graves brought in from a wide area of south-eastern Italy, from the 'heel' right up to the 'spur'. Here too are buried men who died in two disastrous explosions in the harbour at Bari, when ammunition ships exploded in December 1943 (during a German air raid) and April 1945. Bari War Cemetery contains 2,128 Commonwealth burials of the Second World War, 170 of them unidentified. There are also some non war burials and war graves of other nationalities. The cemetery also contains 85 First World War burials, brought in from Brindisi Communal Cemetery in 1981. Most of these burials are of officers and men of the Adriatic drifter fleet which had close associations with Brindisi during the First World War.